Spec Ops Multiplayer Is a "Cancerous Growth"
Spec Ops: The Line Lead Designer Cory Davis has some very harsh words for the game's multiplayer. I've heard some pretty good things about Spec Ops: The Line, the third-person modern combat shooter released by 2K Games in June. It apparently combines decent gameplay with a powerful, compelling narrative that elevates it, at least in story terms, above most such shooters. But as good as it is, not everyone is satisfied with everything about it, including lead designer Cory Davis, who had some nasty things to say about the multiplayer component of the game. "[Multiplayer] was literally a check box that the financial predictions said we needed, and 2K was relentless in making sure that it happened - even at the detriment of the overall project and the perception of the game," Davis said in a far-reaching interview with Polygon. The multiplayer side of the Spec Ops coin was developed by Darkside Studios, who Davis said produced a "low-quality Call of Duty clone in third-person" that "tossed out the creative pillars of the product." "It sheds a negative light on all of the meaningful things we did in the single-player experience. The multiplayer game's tone is entirely different, the game mechanics were raped to make it happen, and it was a waste of money," he continued. "No one is playing it, and I don't even feel like it's part of the overall package - it's another game rammed onto the disk like a cancerous growth, threatening to destroy the best things about the experience that the team at Yager put their heart and souls into creating." 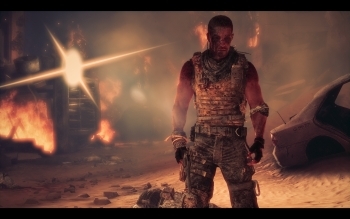 As is so often the case, the critical acclaim for Spec Ops: The Line hasn't translated into big numbers at the register, and Take-Two Interactive blamed its sub-par financial results for the first quarter of the 2013 fiscal year largely on lower-than-expected sales of the game. Did the presence of a completely separate online component drag the game down in the eyes of potential buyers? It seems unlikely, but if 2K attempted to position it as a competitor to online heavyweights like Modern Warfare or Battlefield, it certainly wouldn't have done it any favors. Yet in spite of his harsh criticism - and you won't get much harsher than that - Davis gave props to 2K for green-lighting the game in the first place. "They took a hell of a risk with the project that other publishers would not have had the balls to take," he said. "I'm proud of what we were able to achieve, and it was not easy."